Members of the East Village Association board brought Ald. Proco "Joe" Moreno homework with their first meeting April 21. The assignment for the new 1st Ward alderman: to read a 20-page brief the board prepared, with EVA positions on issues the alderman will face. The briefing document is available for download as a PDF file. 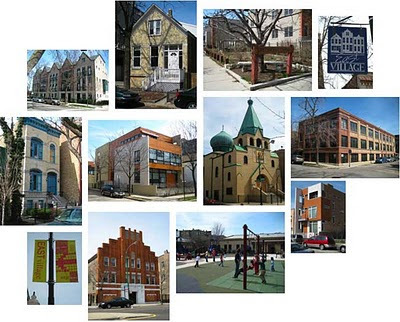 Community groups in Chicago frequently review zoning variances and other issues in their neighborhood for which the alderman recommend City Council action. EVA asked to be included in not only variances but also requests for zoning changes, special uses and liquor licenses, and permit applications for demolition and sidewalk cafes. By longstanding practice, EVA does not support projects it reviews, but can "oppose" or "not oppose" them. The brief outlines EVA's review process, adopted in 1998 and revised in 2007. Transit-oriented development at Division, Ashland and Milwaukee, with zoning to support pedestrian use and sidewalk protections along Division Street. Tree planting along Augusta Boulevard. Preservation of St. Boniface Church, at Chestnut and Noble. Enforcement of commitments made last year in a restaurant rezoning at 1924 W. Chicago and a hotel special use at 1659 W. Division. Continued public use of the 13th District police headquarters site. Completion of the West Town branch library at Chicago and Ashland, and monitoring of Chicago Avenue retail development. Language Academy II, 1148 N. Wolcott. An EVA timeline and officer biographies were also part of the brief.